MASON, Ohio (Ticker) - A day after pulling off huge a surprise in the ATP Western & Southern Financial Group Masters, Andy Murray continued his tear through seeded players. Murray, a 19-year-old rising star from Britain, followed up the shocking upset of defending champion Roger Federer with a 7-6 (7-3), 2-6, 6-4 victory over No. 15 American Robby Ginepri on Thursday in the third round of the $2.45 million hardcourt event. The winner earlier this year at San Jose, Murray had reached the Washington final and Toronto semifinals in his first two tournaments under coach Brad Gilbert. Gilbert's tutelage continued to pay dividends Thursday as Murray overcame a lull that spanned the second and third sets. Trailing 4-2 in the decisive set, Murray battled back by winning the next four games. He captured the match when an equally-tired Ginepri hit his forehand into the net to end a rally. Murray, who became the first player other than Rafael Nadal to beat Federer in 65 matches this season, was playing in his 13th match in the past 2 1/2 weeks. He next will face ninth-seeded American Andy Roddick, a 6-3, 6-4 winner over Juan Ignacio Chela of Argentina. "This is the first time that I played three weeks in a row and won at least three matches," Murray said. "I could have only played one more match if I'd won against Gasquet last week in the last three weeks. So, you know, I'm just not used to this, so that's probably why I'm feeling tired. But, you know, definitely, I don't know how long I can do this for because it's never happened to me before. "I think there's not too many guys on the tour that would be feeling good after playing as many matches as I have, you know, bar kind of Nadal. I mean, even Federer said he was tired after winning in Canada last week and coming here, so that shows how tough the conditions are, especially playing at the highest level." Despite his youth, Murray displayed some cunning in the 10th game of the opening set. Trailing 4-5, Murray appeared to have dropped the first set on a break of serve when his backhand was called long. However, the Brit challenged the call and saw it overturned before he rallied from a 15-40 deficit to even the match at 5-5. In the third, Murray appeared to be in more trouble with Ginepri serving for a 5-3 lead. But Murray fought for one of his three breaks in the match, held his own serve and broke again to advance. "I mean, I started playing a little bit tentative and he took a couple big rips, took some chances," Ginepri said. "He wasn't going to stay in the point, try to rally and win it that way, so he's got to go for it. Got, I guess, a little tight. "I didn't really feel that tight, but started missing first serves and backing off on how I got up in the third set. It was mine to win and I didn't capitalize. It's disappointing when things haven't been going that great the whole year and then this rolls up. But I'll get over it." The second-seeded Nadal continued his hunt for his sixth title of the season by dispatching 14th-seeded German Tommy Haas, 7-6 (7-5), 6-3. It was the second consecutive straight-sets victory for the Spanish lefthander, who had to rally for a 6-7 (5-7), 6-2, 6-3 win over American wild card Sam Querrey on Tuesday. A two-time winner in the ATP Masters Series this season, Nadal opened up the tight match when he broke Haas' serve at love to grab a 5-3 lead in the second. He finished up on serve to improve his record to 48-6. The next opponent for Nadal will be countryman Juan Carlos Ferrero, who posted a 7-5, 6-4 victory over Sweden's Robin Soderling. 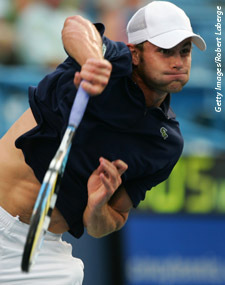 The 2003 French Open champion and a finalist here in 2002, Ferrero upset No. 6 James Blake of the U.S., 6-2, 6-4, on Wednesday. Fourth seed Ivan Ljubicic of Croatia turned around his recent struggles against No. 16 Dominik Hrbaty of Slovakia with a 7-5, 6-4 victory. Ljubicic, who had dropped the past two meetings, improved to 6-2 in the series. "I have to say that Dominik really improved a lot in the last two years," Ljubicic said. "I had a 5-0 record against him before the Davis Cup final last year, and I lost that in five (sets). And then I lost in Rome again this year. Today again was really difficult." The third ranked player in the world, Ljubicic next will face seventh-seeded Tommy Robredo of Spain. Robredo routed France's Florent Serra, 6-3, 6-1. The 13th seed from Argentina, Fernando Gonzalez also survived a battle by dispatching Swiss wild card Stanislas Wawrinka, 7-6 (7-2), 7-5. Wawrinka had upset No. 3 David Nalbandian of Argentina on Wednesday. Gonzalez's next opponent will be No. 10 David Ferrer. The Spaniard upended eighth-seeded Marcos Baghdatis of Cyprus, 7-5, 6-4.